Image: Stephanie Zieber/Getty Images. Catarina Bessell/Getty Images. Design: Kenzie Mastroe/SheKnows. Congrats! You’re getting hitched. That means you’ve gotten over your fear of commitment. You might even say the only scary thing about your relationship now is how much you love your soon-to-be spouse. 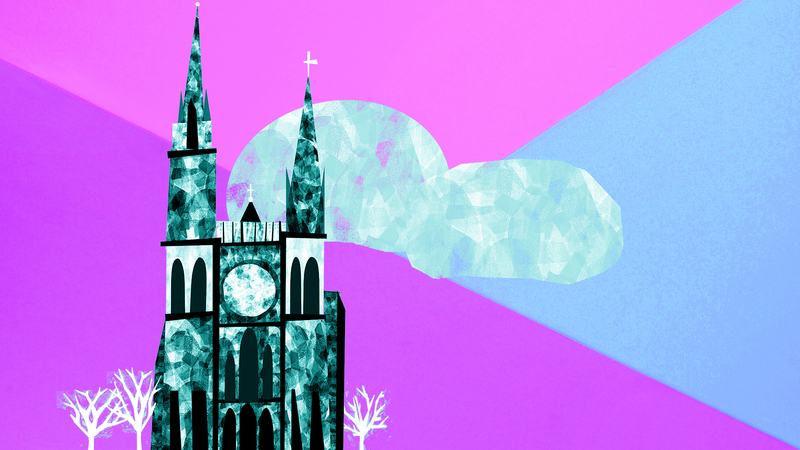 So why not hold your wedding somewhere stunning and historic — that just so happens to also be haunted? You braved the modern dating scene prior to finding your true love. You’re not afraid of anything anymore. Maybe you’ve always veered toward the macabre. Perhaps you consider yourself a bit of a paranormal enthusiast. Or it could be that you simply want to make sure the wedding venue you’ve chosen isn’t on this list. 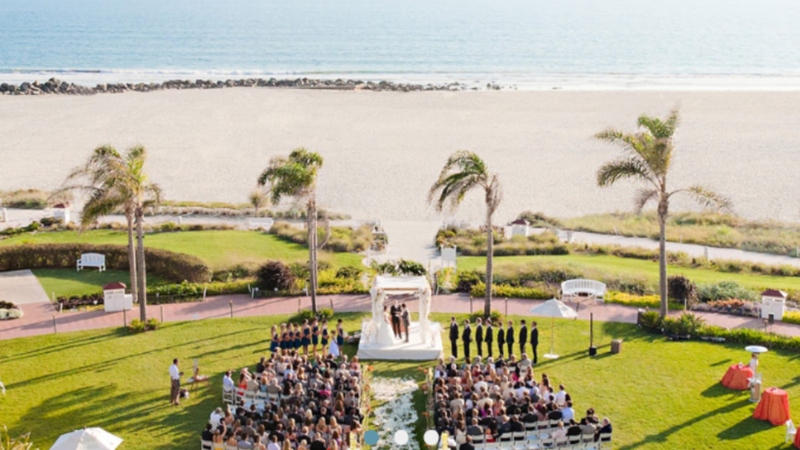 Whatever the case may be, we found some of the most breathtaking spots to get married in the country, and yes, they may include a few extra-special (or to be more accurate, spectral) guests. Kinda gives new meaning to “till death do us part,” huh? Built in 1886, the iconic Driskill Hotel in downtown Austin is steeped in paranormal lore. The hotel's namesake and founder, Colonel Driskill, is rumored to haunt the halls — emitting the telltale smell of cigar smoke. In 1887, the young daughter of a Texas senator fell down the grand staircase and died only to return as a ghost and chase her ball around the first-floor lobby. Other spooky rumors include two "suicide brides," who committed suicide in the same tub in the hotel 20 years apart to the day. Image: Ohio State Reformatory Prison. 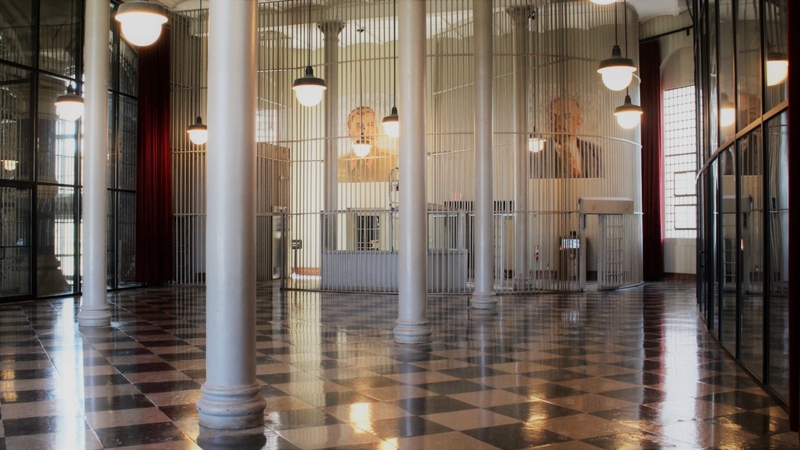 You may be thinking, "Why would I want to get married in a prison?" To which we would respond, "Why not?" Especially if that prison happens to be the legendary Ohio State Reformatory Prison. Of the 154,000 inmates who came through while it was still an active prison, it is said many never left. And to say the prison (which was memorably used in filming The Shawshank Redemption) has endured a streak of unnaturally bad luck would be an understatement. In addition to the Mad Dog Killings of 1948, the warden's wife accidentally shot herself with a hidden pistol in 1950, and a few years later, the warden suffered a fatal heart attack. They supposedly joined the inmate apparitions already haunting the reformatory. 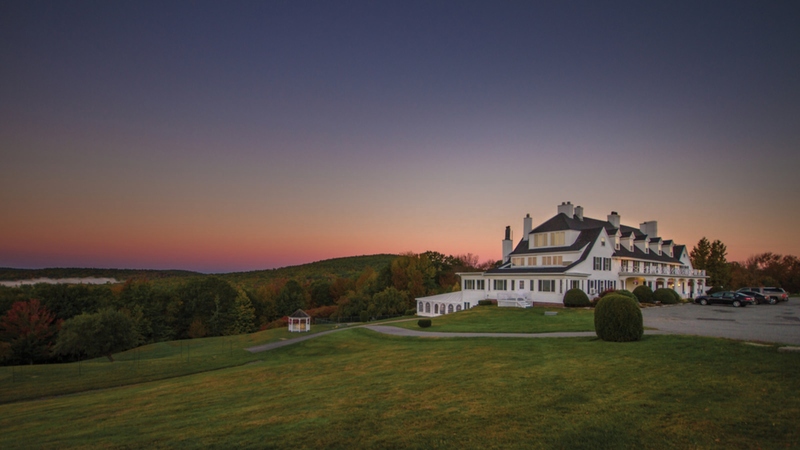 Image: The Omni Mount Washington Resort. 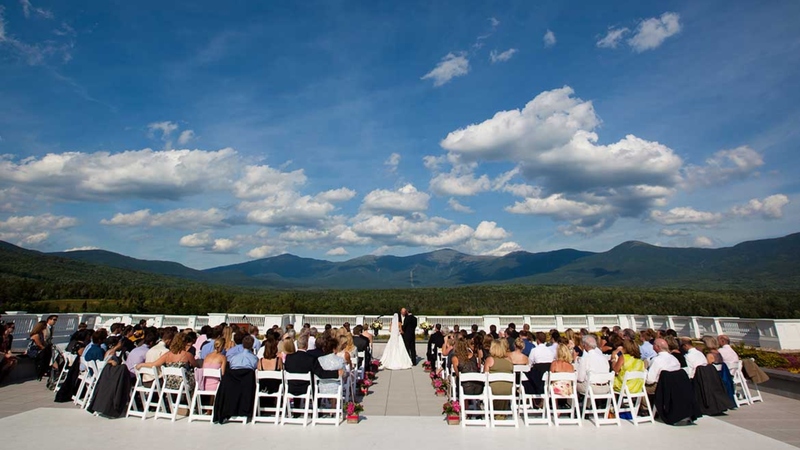 The Omni Mount Washington Resort would undoubtedly make a beautiful backdrop for any wedding. However, be prepared for a possible photobomb of the ghost kind. Completed in 1902, this historic hotel was opened by a wealthy industrialist by the name of Joseph Stickney, who died only a year after it opened to the public. He was survived by his wife, Carolyn, who remarried a short time after and continued to summer at the hotel. It was only after Carolyn died in 1936 that reports began surfacing from staff and guests about strange things happening — like lights turning on and off by themselves and the shadowy figure of a woman appearing in a staff picture. Ghost Hunters has investigated Carolyn's presence at the hotel twice. Image: The Hotel del Coronado. You can't get much more scenic than this circa 1888 seaside hotel. The trade-off is you may be visited by the ghost of Kate Morgan during your nuptials. Found dead of a gunshot wound to the head on the beach in 1892, forever-24-year-old Morgan can't seem to stay away from the affectionately dubbed Hotel Del. The havoc she wreaks includes moving drapes, falling screens, mysterious noises, flickering lights and even the figure of a woman wearing a black lace dress. 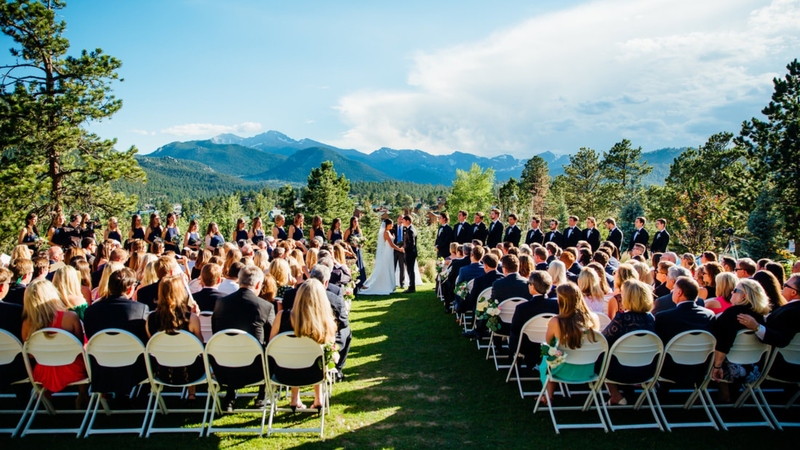 Need a helping hand on your wedding day? How about many — all invisible? That's precisely the sort of thing guests who've stayed in the Hawthorne Hotel's Room 325 have reported feeling. Given that information and the fact it's located in the former witch-hunting capital of the States, it's little wonder this venue is ranked one of the top 10 most haunted hotels in America. 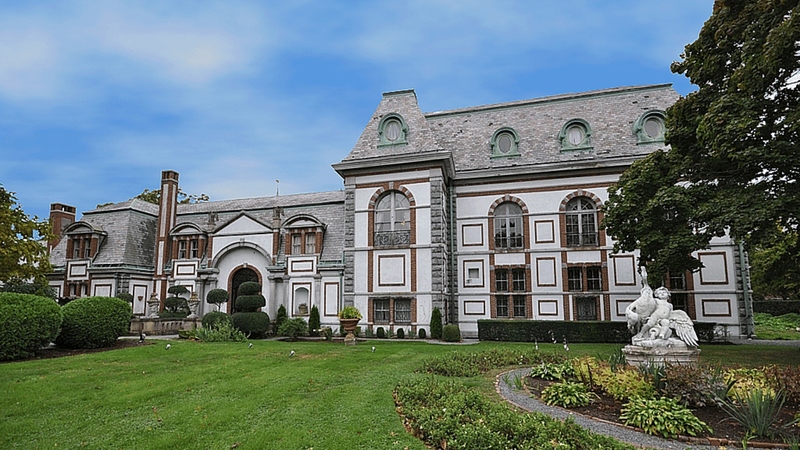 If you want to get married at a grand estate, you can't go wrong with Belcourt Castle. However, there is one caveat: Several of the items inside the castle could be haunted. Think of it as the manor from Beauty & the Beast, only scarier — guests have reported seeing possessed furniture, a screaming suit of armor, a monk statue with accompanying apparition and a mirror that doesn't reflect back the people staring into it. But, hey, it sure is pretty! Image: The Pen Ryn Estate. Just a heads-up: If you plan to get married on Christmas Eve at The Pen Ryn Estate, be prepared to put up with a few surly guests who definitely didn't RSVP. Or maybe long-deceased owner Robert Bickley's RSVP got lost in the mail — along with the plus-one for his also long-deceased girlfriend. No matter, though. They'll show up anyway. And on Dec. 24, Bickley reportedly knocks on doors and windows while his girlfriend (riding a black horse, no less) whips anyone who dares to cross her path. Yes — that Stanley Hotel. As in, the one Stephen King modeled The Shining's Overlook Hotel after. The room King stayed in while writing the book, Room 217, is said to be a hotbed of paranormal activity. Among the happenings, there was the electrocution of a housekeeper during a lightning storm. The hotel's original owners, F.O. and Flora Stanley, are also often seen in the hotel. Mr. Stanley apparently favors playing the piano, while his wife lingers in the billiards room or lobby. Image: The Congress Plaza Hotel. 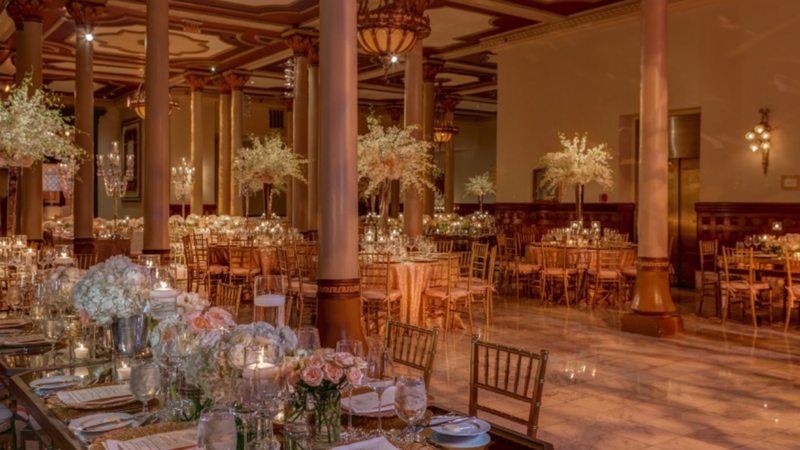 You might call Chicago's Congress Plaza Hotel a hidden gem among haunted wedding venues. For starters, it's jaw-droppingly picturesque. 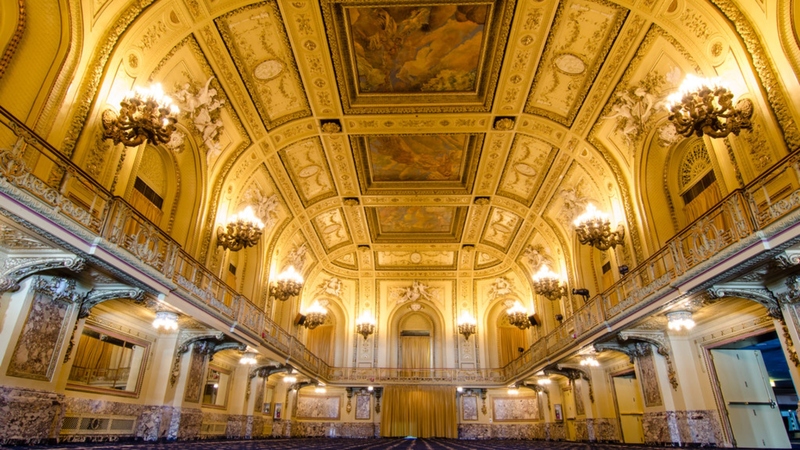 But in regard to the paranormal, it's also thought to be one of Chicago's most haunted spots. You just don't hear about it much. However, according to Sherman's Travel, the hotel experiences more than its fair share of spooky occurrences. The staff often reports seeing the ghost of a young boy, one who is rumored to have been thrown off the roof of the hotel by his mother before she took her own life. And some of the staff actively avoid the Florentine Room, where it's said a female ghost whispers in people's ears. Then there's the peculiar case of Room 441. Throughout the hotel's history, more guests have called security from there than any other space — and they all report seeing a shadowy woman. 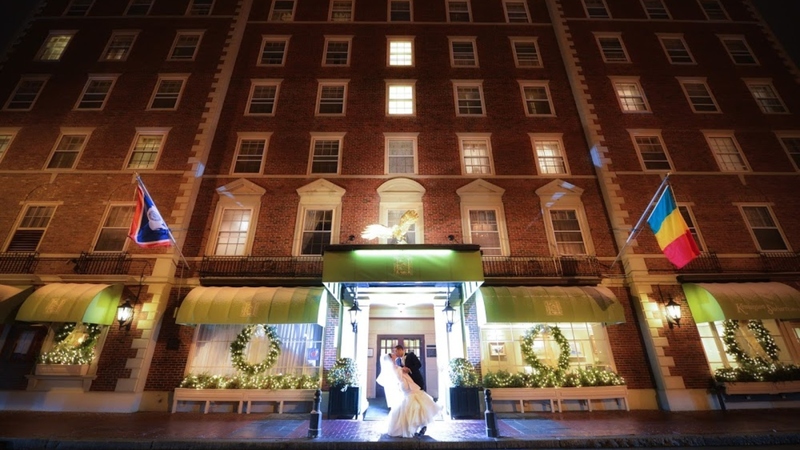 Built in the 1800s, this inn in Bangor, Maine, is sure to impress all your wedding guests. Still, you may not want to mention it is speculated that the original owner of the inn murdered his wife and her lover in the hotel before taking his own life. 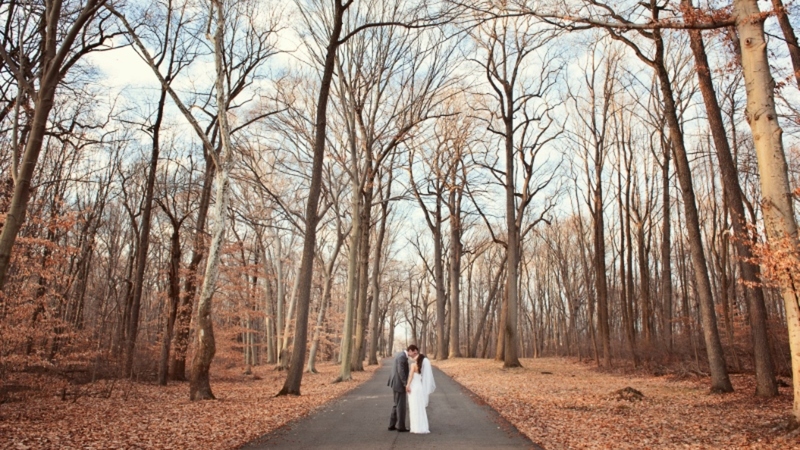 Oh, did we mention it's possible all three are haunting this scenic nuptials spot? 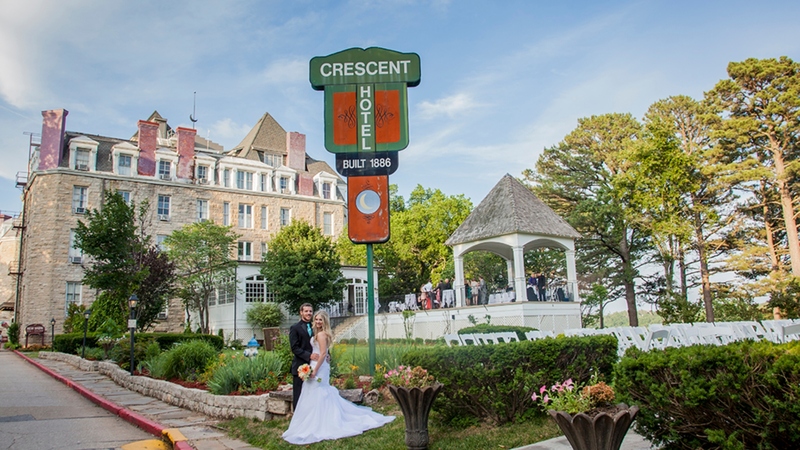 If you watch and put any stock in the show Ghost Hunters, then you'll consider the Crescent Hotel to have tons of paranormal street cred. When the show's Jason Hawes and Grant Wilson visited, they claimed to have caught a full-body apparition wearing a hat and nodding on their thermal camera. According to local folklore, a construction worker fell to his death when the hotel was being built more than 100 years ago, and he landed in what eventually became room 218. Not surprisingly, guests and staff report unexplained activity in that room, from a self-flushing toilet to humanless footsteps. In fact, there's a whole website devoted to America's most haunted hotel.